" 'Persona non grata' is a psychological film with obsessive suspicion as its leading motif. The main character is an idealist who devoted the best years of his life to the struggle for freedom, and today feels a sweet disillusionment", says Krzysztof Zanussi. The strength of this film is in the acting. The screenplay was written with specific people in mind, the main parts are played by Zbigniew Zapasiewicz and Nikita Mikhalkov. Zbigniew Zapasiewicz, who has worked with Krzysztof Zanussi for years, is very credible in this film. Nikita Mikhalkov is great - he creates a strong, genuine character. The main character, played by Zapasiewicz, is Wiktor, the Polish ambassador to Uruguay, whose beloved wife dies. Wiktor is an honest, righteous man, an oppositionist from communist times. He struggles with many problems at the embassy in Montevideo - the counsellor at the embassy, a former communist apparatchik, is probably an embezzler. Wiktor's protégé, Waldemar the consul, gets involved in drug smuggling. In addition, Poland is competing for a contract to deliver helicopters to Uruguay, its rival being Russia. There could be a spy at the embassy - perhaps Waldemar's wife? Wiktor hopes the doubts will be partially explained when he meets Oleg, a Russian diplomat involved in the helicopter bid. Oleg used to be a friend of Wiktor's, he worked at the Soviet embassy in Poland years before. The meeting with Oleg should not only resolve the bid issue, but also bring answers to a question tormenting Wiktor - did his wife ever cheat on him with Oleg? 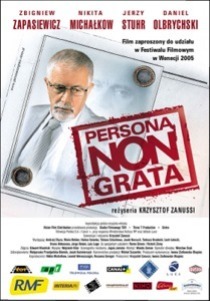 Persona non grata is a film about regret, obsessive suspicion, becoming reconciled with one's fate, and dying. Wiktor cannot accept that times have changed - there are no clear-cut divisions into friends and foes anymore. He is suspicious of everyone, and copes badly with the new reality. "The issue here is the hardship of an educated Pole who finds himself in a new political and social situation. This man worked and fought for this change, he was committed to it. It turns out, however, that we don't really know how to behave within the freedom we have won", says Zapasiewicz. In its style, Zanussi's film is similar to his earlier productions. Zanussi constantly maintains the same standard and elegance of his films, regardless of the changing times and the requirements of modern cinema. We will find no surprises or strangeness in this film. What we will find, as always, is excellent acting, and problems characteristic of Zanussi's work, all in a musical setting composed by Wojciech Kilar. Persona nona grata, Poland, 2005. Directed by Krzysztof Zanussi, screenplay by Krzysztof Zanussi, director of photography: Edward Kłosiński, production design: Anna Jagna Janicka, costume design: Anna Jagna Janicka, music by Wojciech Kilar, film editor: Wanda Zeman, producer: Iwona Ziułkowska-Okapiec, Leonid Wereszczagin, Krzysztof Zanussi, Nikita Michałkow, Rosanna Seregni. Featuring: Zbigniew Zapasiewicz (Wiktor Leszczyński), Nikita Michałkow (Oleg), Jerzy Stuhr (radca), Daniel Olbrychski, Maria Bekker (Oksana), Andrzej Chyra (Waldemar), Remo Girone (Consul Alfredo), Victoria Zinny (Luciana), Bruno Aldecosea, Carmen Azuar. Produced by Studio Filmowe Tor, Three T Productions, Sintra. Co-produced by Telewizja Polska - Agencja Filmowa, Canal+ Polska. Distribution: Vision. Duration: 113 min. Cinema premiere: September 9, 2005. - Jury Award for Krzysztof Zanussi at the Polish Film Festival in Gdynia. - Eagle - Polish Film Award: for best music of 2005 for Wojciech Kilar; best sound of 2005 for Wiesław Znyk; best sound of 2005 for Jacek Kuśmierczyk; best editing of 2005 for Wanda Zeman; best supporting actor of 2005 for Jerzy Stuhr.